Slice the strawberries in half. Place ingredients into the basket/bottle. Leave to infuse at room temperature or chill in fridge for an hour or longer for a fuller infusion. As strawberries are very soft, they may not last very long – however, both the pineapple and strawberries can be eaten afterwards! 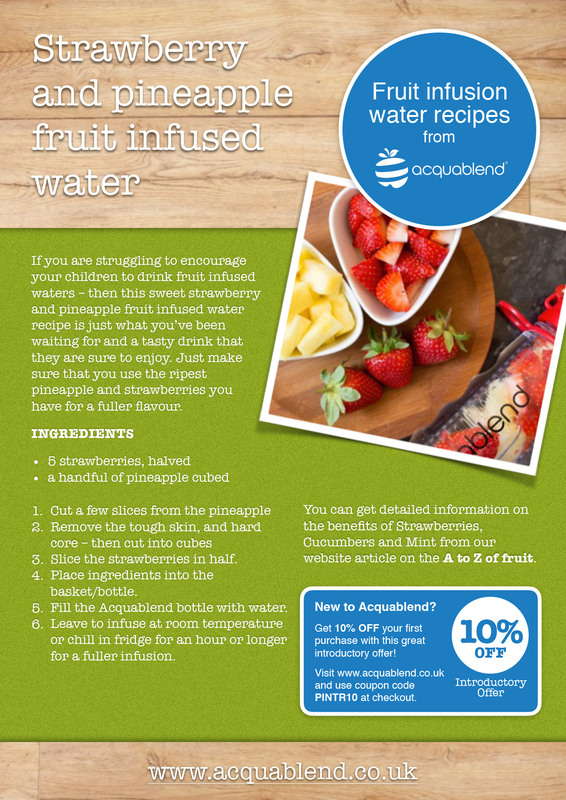 If you are struggling to encourage your children to drink fruit infused waters – then this sweet strawberry and pineapple fruit infused water recipe is just what you’ve been waiting for and a tasty drink that they are sure to enjoy. Just make sure that you use the ripest pineapple and strawberries you have for a fuller flavour. As well as tasting great, both strawberries and pineapples have the following health benefits. Strawberries are high in vitamin C and can help with digestive ailments as well as skin irritations. Pineapples contain high amounts of thiamine, a type of vitamin B that is involved in energy production, and an enzyme called bromelain, which has anti-inflammatory properties.